NASHVILLE, Tenn. (AP) — Bluegrass and country star Ricky Skaggs, singer Dottie West and fiddler Johnny Gimble are the newest members of the Country Music Hall of Fame. The three artists were inducted Sunday at the Hall of Fame and Museum in Nashville, Tennessee, in a ceremony featuring performances from Garth Brooks, Chris Stapleton, Connie Smith and Dierks Bentley. NASHVILLE, Tenn. (AP) — For 17 years, the unofficial start of one of the biggest weeks for fans of country music has been Marty Stuart's "Late Night Jam," which precedes the four-day Country Music Association Festival. NASHVILLE, Tenn. (AP) — Carrie Underwood, Florida Georgia Line and Jason Aldean are the leading nominees for the CMT Music Awards with four each, but it's the pop artists who might steal the big prize at this year's awards show. In celebration of his albums, "From A Room: Volume 1 and Volume 2," Chris Stapleton will hit the road again this year for his All-American Road Show tour. Dates include New York's Madison Square Garden, The Forum in L.A. and Chicago's Hollywood Casino Amphitheatre, among many others. The tour will feature Marty Stuart and Brent Cobb as special guests and tickets are on sale now. The Eagles are scheduled on a few of the dates as well. On Sunday, Stapleton and his wife, Morgane became parents of twins. On the same day ... he won three ACM awards. 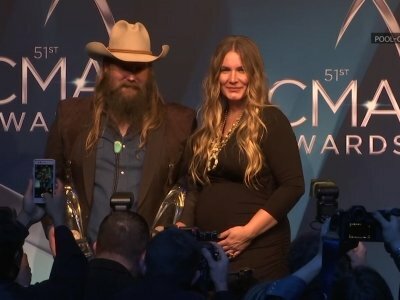 Chris Stapleton has become a father to twins. The 'Tennessee Whiskey' singer won the coveted Album of the Year for 'From A Room Vol. 1' and Male Vocalist of the Year at the Academy of Country Music Awards (ACMs) in Las Vegas on Sunday (15.04.18) but host Reba McEntire revealed he wasn't there in person to collect the accolades because he and his spouse Morgane Hayes have welcomed two boys into the world. Dont be fooled by the title or the latest images with Timberlake looking like he stepped out of a Timberland catalog. Even though theres a song here called Flannel, JT hasnt gone all Bon Iver. To be sure, there are nods to Nashville here and there, especially on the title cut and whenever country maverick Chris Stapleton is involved as a songwriter, guitarist or singer. But Man of the Woods could easily have been titled King of Funk Lite Volume 3. No one asked about Janet Jackson. In a 20-minute QA with Justin Timberlake in front of more than 500 media representatives Thursday afternoon at the Hilton Hotel in downtown Minneapolis, no one asked him about Jackson’s infamous wardrobe malfunction at the 2004 Super Bowl. The news conference was to discuss Timberlake’s performance Sunday at Super Bowl LII at U.S. Bank Stadium. CLEVELAND, Ohio – Justin Timberlake live is amazing. He possesses a nonpareil ability to sing, dance and engage a crowd, all of which will be in evidence on March 31, when he returns to Quicken Loans Arena. Fresh off the heels of his three Grammy wins Sunday night, country music star Chris Stapleton has announced he's hitting the road again. "Chris Stapleton's All-American Road Show" includes newly confirmed shows at New York's Madison Square Garden, Los Angeles' The Forum and Chicago's Hollywood Casino Amphitheatre among others this year, according to a media release issued Monday. And the tour will travel down south with a stop at the Colonial Life Arena in Columbia on Oct. 25. Fresh off of a busy weekend, country singer Chris Stapleton has announced dates for the “All-American Road Show” tour, including a July 19 performance at the Spokane Arena. The tour follows Stapleton’s wins for Best Country Album (“From A Room: Volume 1”), Best Country Song (“Broken Halos”) and Best Country Solo Performance (“Either Way”) at the 60th Grammy Awards, which were held Sunday. BRENTWOOD, Tenn. (AP) — Tennessee songwriter Lee Thomas Miller is dropping out of the race for the Republican nomination to succeed Rep. Marsha Blackburn in Congress. Miller announced Monday he was ending his 7th District campaign about a month after launching it because running for office was causing him to "compromise" himself. Miller is a three-time Grammy nominee who has written songs for Trace Adkins, Brad Paisley, George Strait, Jamey Johnson and Chris Stapleton. NASHVILLE, Tenn. (AP) — These last few years, Chris Stapleton is often surprised by early-morning texts of congratulations from his friends. Take, for instance, last week, when the Grammy Award nominations were announced. Like high schoolers earning college credits, the country music industry seems eager to fast-track rising stars into arena headliners. Chris Stapleton graduated to arena headliner after his second album. Sam Hunt zoomed to the big marquee after just one album. And Thomas Rhett made his first Twin Cities headline appearance Wednesday at sold-out Xcel Energy Center to promote his third album. The nominations for the 60th GRAMMY Awards were announced on Tuesday morning, and a couple area natives from The Country Music Highway were included in those announcements. NEW YORK - The nominations for the 60th Grammy Awards were announced Tuesday morning, and a couple of area natives from The Country Music Highway were included in those announcements. BRENTWOOD, Tenn. (AP) — Songwriter Lee Thomas Miller announced Tuesday that he is joining the race for the Republican nomination to succeed Rep. Marsha Blackburn in Congress. Miller has written songs for Trace Adkins, Brad Paisley, George Strait, Jamey Johnson and Chris Stapleton. The three-time Grammy nominee is the son of a Kentucky tobacco farmer and a small town librarian who lives in Brentwood with his wife Jana and four children. Yes, Garth Brooks won entertainer of the year and Chris Stapleton picked up two honors, including album of the year. 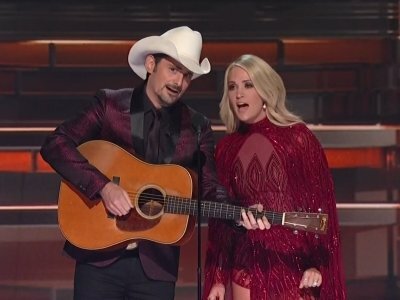 But the moments that truly dominated the 2017 Country Music Association Awards had less to do with winning, and more about a community banding together to heal. 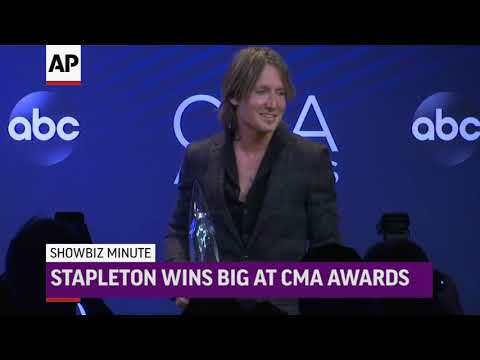 Here's a look at some of the top moments at the awards show, which aired live Wednesday night from the Bridgestone Arena in Nashville, Tennessee.